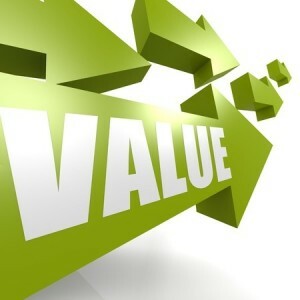 Share customer feedback widely throughout organization. This article will explore five industry trends related to the first two practices, where there is a huge gap between Leaders and Laggards. Nearly 20 years ago, CustomerSat and Satmetrix were founded to spark what most analysts now call the Enterprise Feedback Management (EFM) industry. That’s a really long time in enterprise software. Since then, more than a dozen major vendors have entered the space, with customer survey management as a core function. CustomerSat was sold to MarketTools in 2008, then to Confirmit in 2012. During the past few years there has been some minor consolidation of the industry, with the bigger — and better financed — players picking up technology to expand their platforms. In other activity, InMoment (formerly Mindshare) acquired Empathica in 2013 to expand its geographic and industry footprints. At the time, CEO John Sperry noted a desire to reach $100M in revenue in three to four years — right about now – which would make an IPO or acquisition a viable exit strategy for investors. In recent years OpinionLab and Vovici were snapped up by Verint, and NICE acquired Attensity by way of InContact. MaritzCX, one of the few vendors with an equal emphasis on software and services (Walker is the other), is the result of market research firm Maritz acquiring EFM vendor Allegiance in 2014. In late 2016, newly minted CEO Mike Sinoway told me that, although investors don’t always “get” the combination of product and services, and not every customer wants both, nonetheless it’s a way to differentiate in a crowded EFM space and help clients improve customer experience and loyalty. Forrester gave MaritzCX strong ratings in “support, professional services, benchmarking, and client success” along with InMoment, Qualtrics, and SMG. To that list, I would add Walker, which is strong in large/complex B2B, especially if consulting services are also required. And possibly IBM, which made a splash with a Voice of Customer Analytics announcement in 2009, but hasn’t followed it up with much since. Still, while Big Blue doesn’t go to market with a packaged offering, it nonetheless has the tech components needed to build a VoC analytics platform for very large complex enterprises. In any case, that’s at least 12 key players in large enterprises. With the exception of IBM, most could be acquired by either a) a bigger EFM player after an IPO, or b) much larger tech firms active in the CRM market, like Oracle, Salesforce.com, or SAP. Or, possibly a big contact center player like Cisco or Genesys. I think it’s inevitable that as VoC platforms evolve and grow, CRM/CX systems will eventually tightly integrate VoC capabilities. As soon as one of the bigger fish makes a move, the rest will follow. 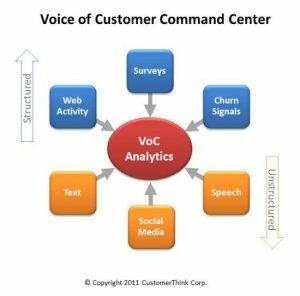 Nearly six years ago I wrote about the need for a Voice of the Customer Command Center as a platform to consolidate and analyze six different feedback dimensions, so that appropriate action could be taken. It was just a proposal, because there was no such thing back then. But it seemed to me that customer-centric business leaders would need such a capability, either by integrating specialized listening tools, or eventually moving to an all-singing-all-dancing VoC platform. And indeed, subsequent CustomerThink research revealed that leading brands are much more aggressive in their use of unstructured sources including text, social media and speech. They are also more likely to use data collected via enterprise systems and web sites. Based on recent interviews, the multi-channel VoC strategy is in full force for the EFM industry. Dorian Stone, VP CX Strategy at Medallia, says that in addition to surveys, their platform can handle receipt-based codes, mobile, text messages, web site intercepts, IVR, agent feedback, social media, and more. And, the system has been “architected to play well with others” – data can be imported from CRM, POS and ERP systems. Of course, other major EFM vendors are pursuing similar strategies. In my view, the incorporation of unstructured (text, speech, social) feedback along with enterprise data (CRM, POS, web) is critical. Clarabridge, InMoment, and Medallia stood out in Forrester’s analysis. Although all of the major EFM platforms are multi-channel to some degree, there are important nuances in exactly which channels are supported and how the data can be analyzed, reported, and made actionable. 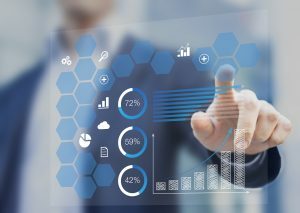 Given the overriding importance of action, some sophisticated enterprises might find it more effective to select a strong data analytics platform and integrate in survey input, rather than investing in a strong survey vendor with weak integration capability. In CRM’s heyday, there was much talk of getting to “one version of the truth” by investing in a platform with one customer database, supporting marketing, sales, and service. Left hand, meet right hand! In the VoC industry, there is a similar issue. With multiple potential sources of customer feedback (up to 40 according to this article by Bill Price), companies need to social desirability bias and other factors, what people say doesn’t always match what they do. Canadian-based iPerceptions incorporates triangulation into a solution that combines solicited feedback from web surveys with behavioral clues from web analytics. 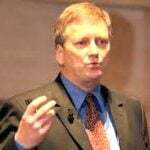 SVP and Co-founder Duff Anderson says combining what people say with what they do improves the quality of decisions, so that firms can target visitors that show signs of distress, or engage with the best prospects for marketing outreach. Timing and context also matter. Social media can serve as the “canary in the coal mine” for incidents that will be reported via email and surveys much later. For example, a large food company was able to use Anexinet’s ListenLogic Omni-Channel Analytics Platform to pinpoint the source of a quality problem by finding a pattern of complaints that started in social media, then migrated to email and calls. A relatively new entry in the VoC multi-channel derby is CloudCherry, which provides a “one view” dashboard of 17 different channels. SVP & GM Rose Bentley, an EFM industry veteran formerly with Satmetrix, says they expect to differentiate based on an open stack platform that can easily integrate with anything. While CloudCherry can support surveys, it’s clear from Bentley’s remarks that they see more opportunity in digital channels. Retail scenarios could include analyzing text messages, QR codes, video, even beacons. Customers do care if you listen. But what they really want is action. Unfortunately, my research finds only about one in five companies are effective at closing the loop. 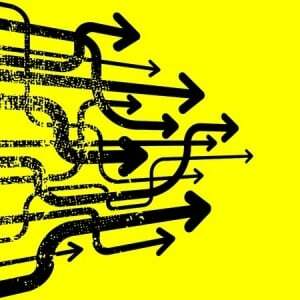 Other research by Temkin Group found that about one-third of VoC programs are “good” or “very good” at making changes to the business based on VoC insights. In 2014 I wrote about how Avis used a mobile-optimized survey sent within 15 minutes of a car return, coupled with rules that enabled alerts to local managers, to engage with unhappy customers and resolve issues immediately. Other applications would involve mining call center recordings, operational data, and geolocation information to act without waiting for a survey response. Increasingly EFM vendors have “action planning” or “case management” capabilities to help manage the to-dos that flow out of VoC systems. Forrester ranked InMoment, Medallia, and Clarabridge the top three in this capability. Qualtrics, well-known for its self-serve capabilities, is making a push into the VoC mainstream with its recent platform announcement, backed by a $180 million investment that some say portends an IPO. Mike Maughan, head of global insights, says it’s “not a great goal to simply react” to problems. Instead, predictive analytics should enable companies to take “anticipatory actions” based on data collected about the brand, customers, employees, and products. Instead of spinning up more surveys and spending a lot of effort to interpret what customers are telling you and decipher what customers are saying and doing, doesn’t it also make sense to figure out what customers are not saying and what they are not doing? With the emphasis shifting to data-driven action, it means tighter integration with existing enterprise systems. For instance, very large organizations might deploy solutions like Pega’s Customer Decision Hub — which makes use of sentiment analysis, predictive models, next-best-actions, and machine learning — to drive immediate and personalized actions. Much of what I’ve discussed so far mostly applies to large enterprises. They have been, and continue to be, the focus of most of the traditional EFM providers. SMBs, however, don’t have six figures or more to invest in these systems. A few years ago, a small business might cobble together a VoC “system” (using the term loosely) using a survey tool like SurveyMonkey, spreadsheets, and email. Now there are more purpose-built solutions available. Consider Delighted, an all-in-one solution launched just four years ago. Small businesses can start for free and then pick a plan that fits their needs from $25 to $249/month. Oh, and larger businesses like these sorts of plans, too. Delighted claims as customers major brands Slack, Sonos, and Uber, and CEO Caleb Elston hints that further developments could support a “disrupt from below” strategy. CX experts point to other good options. Lynn Hunsaker of ClearAction says SMBs could can get the job done with ClickTools or SurveyGizmo. “They are very reasonably priced (can do well with $20K/yr) and easy to manage, with all the features necessary to guide and motivate holistic prevention of chronic issues for customers, integration with CRM, etc.” Jana Sedivy of Authentic Insight also likes SurveyGizmo, calling it “surprisingly powerful and flexible.” For medium-sized businesses with retail outlets, she thinks ActoVoice is worth a look. There’s also help for mid-market firms needing more sophisticated text analytics at a price they can afford. To gain actionable insight from unstructured insight, consider Chattermill and Keatext. Multi-location retail firms could use new sentiment analytics capabilities from local SEO vendor Chatmeter to mine reviews from industry-specific review sites to identify and spur action to the store level. VoC platforms should be part of strategic CX and IT planning for any organization, larger or small. To wrap up, I’ll leave you with three tips to make a good choice. Work backwards from desired decisions. With dozens of potential VoC sources and many specialized tools, it’s easy to get caught in analysis paralysis. Start with key decisions, then identify the data required, and then look for the technology to support data collection and analysis. Move towards real-time action. Surveys aren’t going away, but with the shift to digital experiences it’s becoming more and more important to act without waiting for solicited responses. Leading brands are getting ahead by acting on digital and social signals. Tame organizational silos. Learn from the missteps of CRM pioneers: a multi-channel platform doesn’t guarantee people will work together. One CX leader with a mandate to develop and support an end-to-end customer journey can really help. Disclosure: Examples in this article were drawn from discussions I’ve had with vendors who reached out to me in the past few months with briefing requests. They are not necessarily representative of all the industry activity nor should vendor mentions be considered an endorsement. Some vendors discussed have been sponsors of CustomerThink. This is somewhat of a lost art in the era of Enterprise Feedback Management. Part of the reason is the rush to buy technology before stepping back to identify how this fits with how everything happens in the buyer’s company. Another part of it is the EFM sales/success manager doesn’t have a CX/org change background, and focuses on how to use the technology and more of it while the buyer is often a newbie to the CX field and takes tech providers’ advice as gospel. This is a VoC trend that few recognize, but after a few years of using EFM many VoC managers feel painfully. Consequently, many EFMs and other CX tech firms are seeking ways to collaborate with those who’ve been in the CXM trenches, to provide a more balanced framework and guidance to EFM buyers. Emphasis on real-time action is increasingly important for stemming social media tirades, and for situations where the purchase decision can be guided in the moment. Most of the real-time action is following up with dissatisfied respondents — firms were doing that in 1990 or earlier, as soon as the interviewer got off the phone. Directional correctness is sufficient for most business decisions: if a pattern is emerging, act upon it to create value for the whole customer base. Balance is needed. Respondents are a small representation of your customer base. Case management takes a lot of investment, and the most meaningful financial return is in systemic action that typically benefits the entire customer base. I like the trends of cross-channel triangulation and multi-channel platforms, which can be a huge advantage over what was available in the past, and can help us get back to seeking patterns. That’s where the gold is. And I think it’s great that affordable options are a trend. I’m intrigued that despite a consolidation trend among the more established EFMs, there are numerous emerging VoC technology firms, both newly launched and newly surfacing. I hope all of the EFMs will transition to what their buyers need to be successful in the future: anytime access for customers to give feedback, focus on expectations, portfolio synergy (5 Radical Changes to VoC of the Future for ROI Maturity). Thanks for adding your sage advice to this post. Completely agree. I remember a couple of years ago sitting in a CXPA session you ran about VoC. One of the takeaways for me then was that CX pros were dealing with a “big data” problem. More and more diverse sources, each supported by separate tools and decision making processes is not going to cut it in the future. I think big enterprises will increasing move to an “omnichannel VoC” strategy, meaning that insight can be gained *across* channels. Putting up a dashboard that includes multiple channels is a start, but cross-channel analytics will help identify the key issues that must be addressed first — either critical ones that can’t be allowed to fester and explode on social media, or systemic issues that impact a significant portion of the customer base. Over the next five years or so, I think that AI-related tools will be deployed to help make sense of the VoC data deluge, to help surface non-obvious issues and also recommended actions. None of this is to suggest that the role of human judgement will be diminished. If anything, CX leaders will need to upgrade their data science skills to know how best to effectively use analytics. I hope the CXPA and CX consulting community will move in this direction. What do you think? 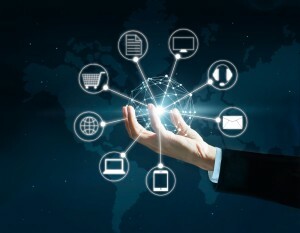 Yes, Bob, omni-channel insights and omni-channel collaboration are essential. I do think that data science will become a bigger part of CXM, especially as more marketing departments take a bigger role in it. Even bigger than the tech and data gaps are the culture and collaboration gaps, as far as what’s needed to achieve the promised $$$ benefits of CXM. Balance in investment (time, money, people) across tech and collaborative endeavors already spells the difference between high CX performers and laggards. A holistic and far-reaching plan (full-circle actionability by as many functional areas as possible) for making use of tech — before signing on the dotted line — is the best way to get full value from CX tech.